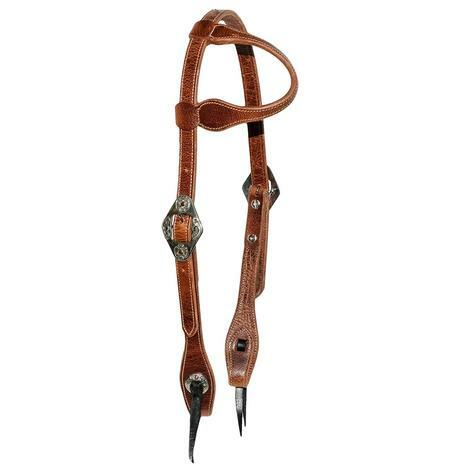 STT Slide Ear Headstall Double Oval Silver Buckle 5/8"
STT slide ear headstall made from heavy oil leather. 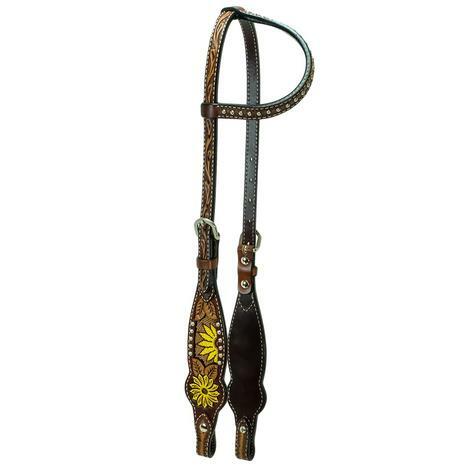 This is a 5/8 inch headstall with doubled and stitched leather, bit tie ends, and double floral brown iron cart buckles. 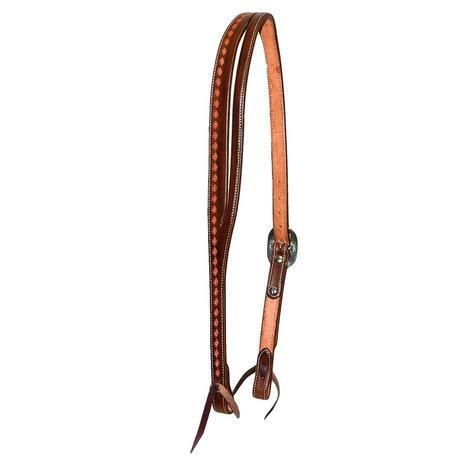 This slit ear headstall is made from harness leather by Cactus Saddlery. It has latigo leather bit tie ends, straight cheeks, and an antique buckle set. 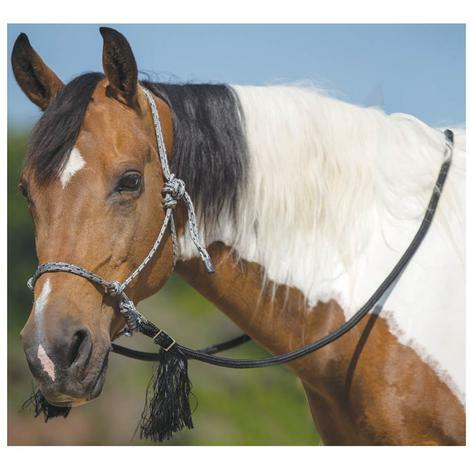 This braided poly headstall is made from rot-resistant rope. This training tool promotes proper head position but doesn't require heavy hands. The twisted wire is featured on the crown and nose. 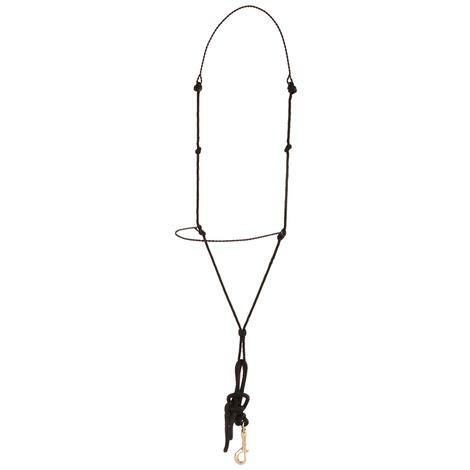 The braided 1/2" x 9' reins with shoo fly ends connect to the curb with nickel plated trigger snaps. 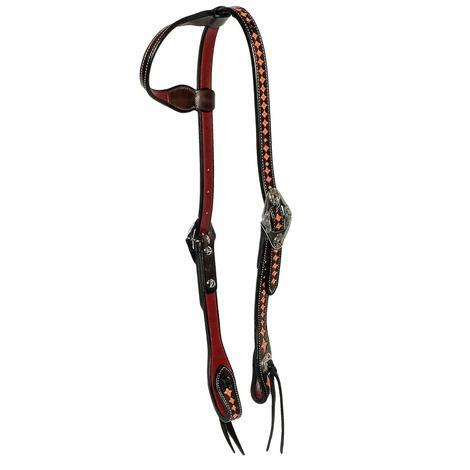 The headstall is made from 3/8" braided nylon rope with nickel plated rings. This is a Rafter T Ranch single slide ear headstall featuring a hand painted Zuni turquoise design with hand tooled leather. 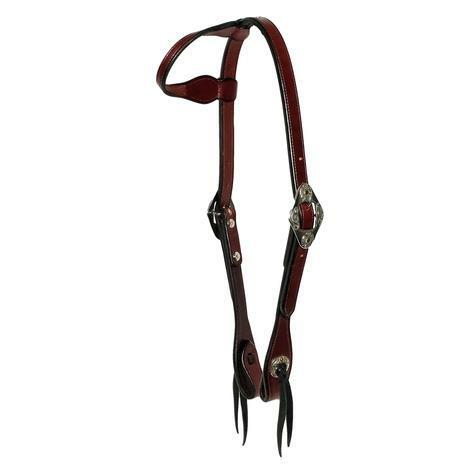 Dual side stainless buckles for adjustable cheek pieces and leather bit tie ends. 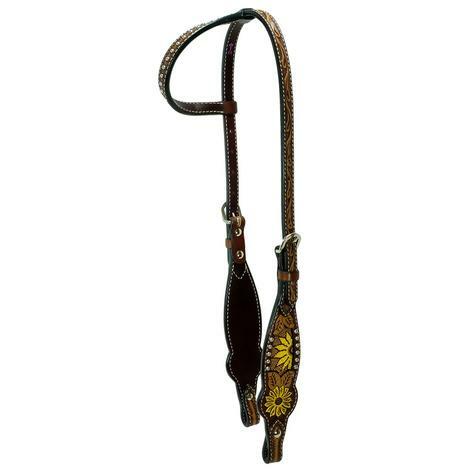 This is a Rafter T Ranch single slide ear headstall featuring a hand tooled sunflower design with beaded inlay and silver stud lining. Hand tooled light and dark leather with dual side stainless buckles for adjustable cheek pieces and leather bit tie ends. 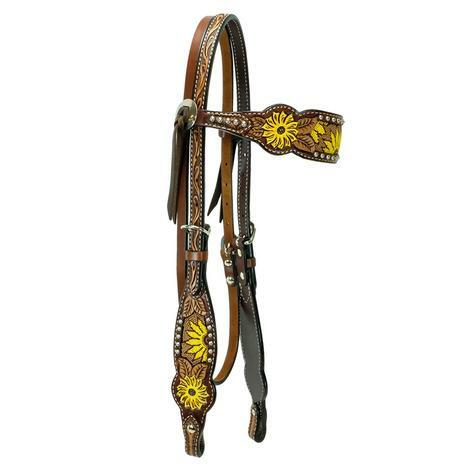 Rafter T Ranch now has the beaded sunflower browband headstall available to match their other tack items in the same family. 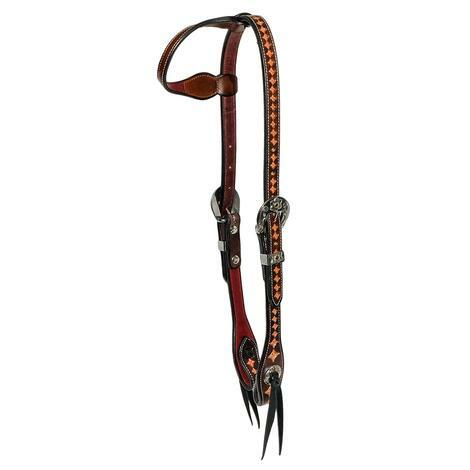 Single buckle adjustable hand tooled cheek pieces and a single buckle throat closure. 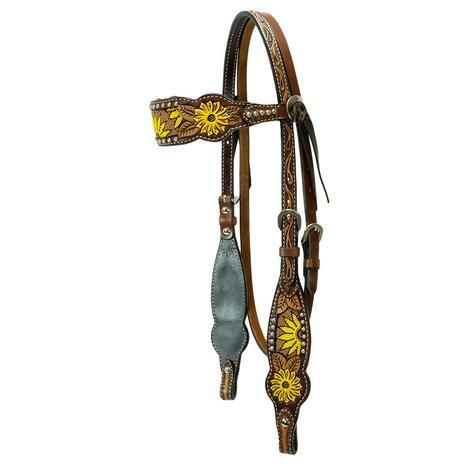 Leather accents are hand tooled with beaded sunflower inlay and stud edging. Adjust to fit. 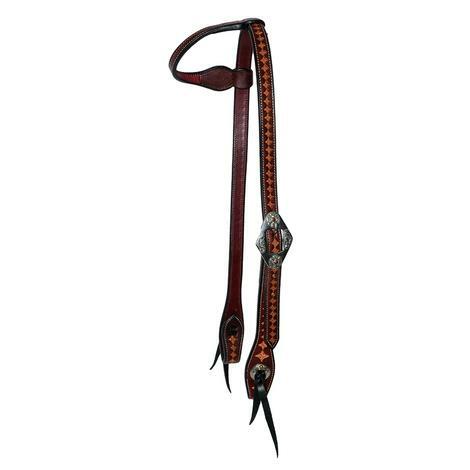 STT Premium Pattern Tooled Diamond Latigo Slit Ear Headstall - Brown or Black 3/4"
Designed for true cowboy and cowgirl performance this South Texas Tack headstall is going to be a must have item in your tack box. It is made from premium leather and tooled. 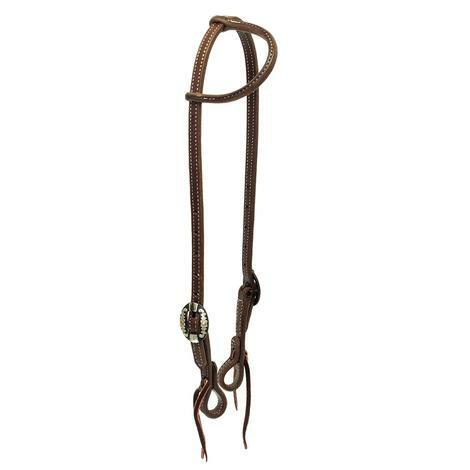 With a latigo tie you can get this headstall in black or brown. Measures 5/8" wide leather. 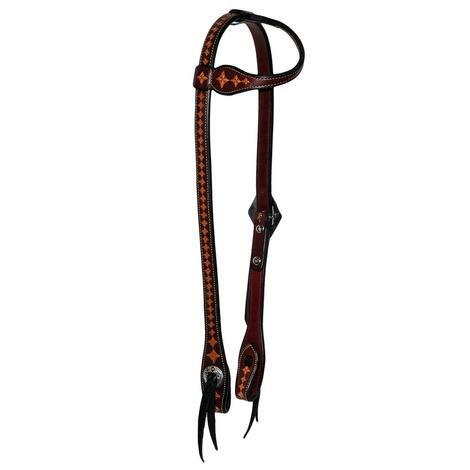 STT Premium Tooled Latigo Slit Ear Headstall - Brown or Black 3/4"
STT Premium Tooled Slit Ear Headstall - Brown or Black 3/4"
This is our premium tooled slit ear headstall, with a brown or black option this headstall is going to be an item you will want to add to your tack box. 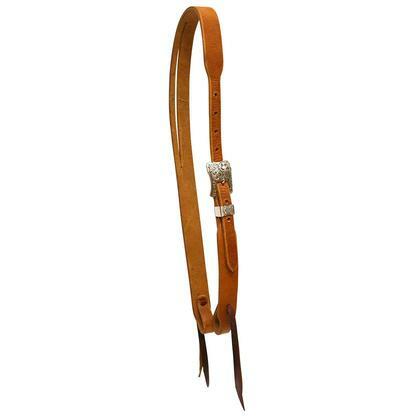 This has latigo tie ends and a single buckle adjustment. Measuring 5/8" wide leather. STT Double Oval Buckle Star Tooled Chicago Screw Slide Ear Headstall - 3/4" or 5/8"
STT Slide Ear headstall in dark oil with double oval silver buckles and star tooled centers. 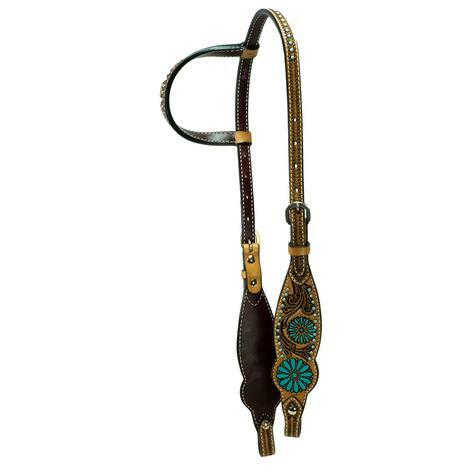 STT custom headstall offered by South Texas Tack in a typical slide-ear design has dual-side oval buckles with copper inlaid scrollwork. Dark Oiled leather is tooled with light center-star throughout the length, and white single stitching throughout. Comes Chicago Screw fasteners as well as in two different widths. Order today! 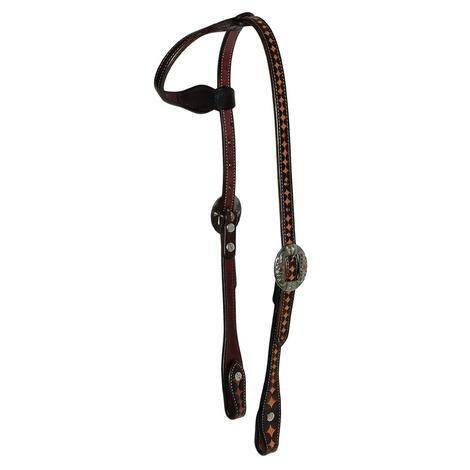 STT Slide Ear headstall in dark oil with single oval silver buckle and star tooled centers. 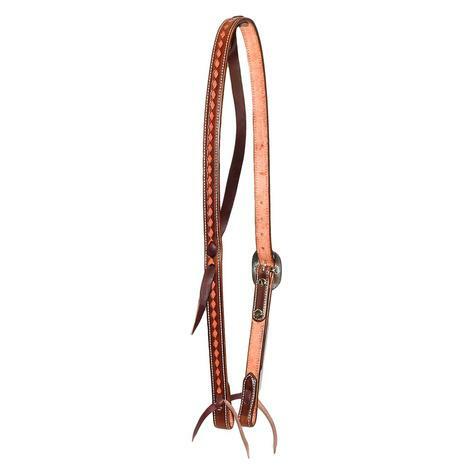 STT custom headstall offered by South Texas Tack in a typical slide-ear design has single-side oval buckle with copper inlaid leaf scroll. Dark Oiled leather is tooled with light center-star throughout the length, and white single stitching throughout. Order today! 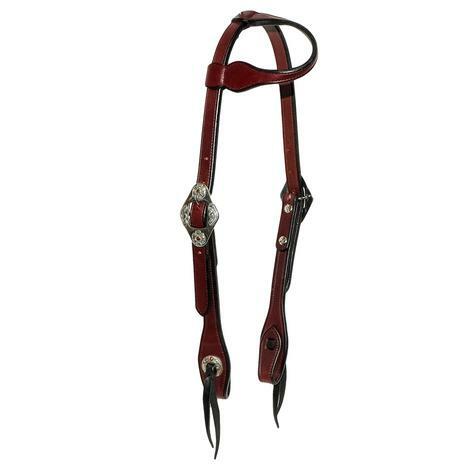 STT Slide Ear headstall in dark oil with double heel silver buckles and star tooled centers. 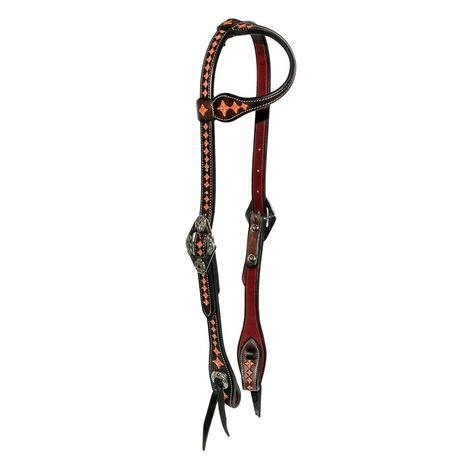 STT custom headstall offered by South Texas Tack in a typical slide-ear design has dual-side heel buckles with copper inlaid shamrocks. Dark Oiled leather is tooled with light center-star throughout the length, and white single stitching throughout. Order today! 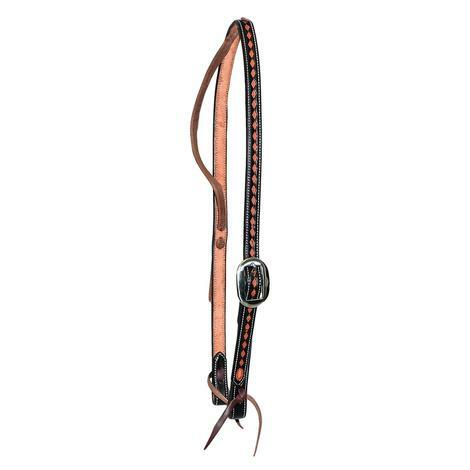 STT English Bridle Leather 3/4" Slide Ear Headstall in Dark Oil. Custom slide ear design in English leather with dual sided diamond or heel buckles with copper inlay. Uses bloodknot fasteners and single stitching. 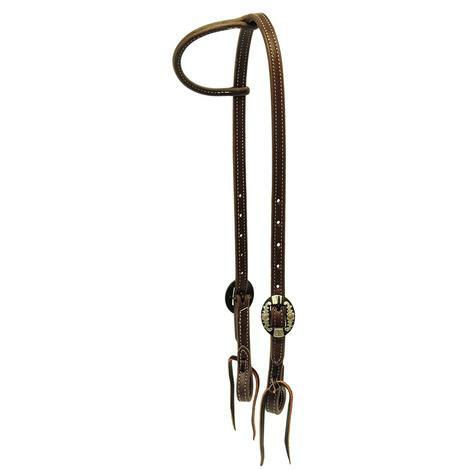 STT Wildebeest leather slide ear headstall from South Texas Tack. 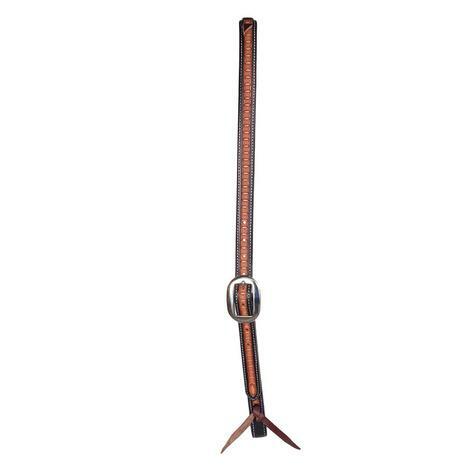 Our custom tack is designed with your equine needs in mind. 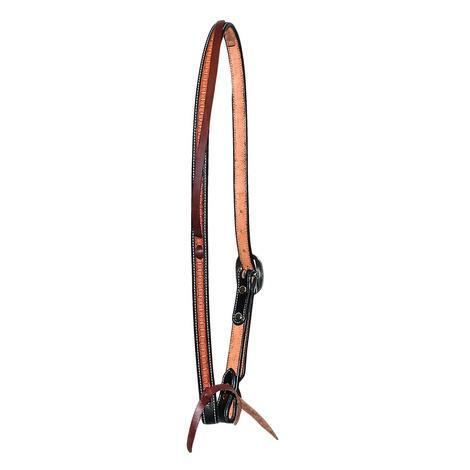 This is a slide ear designed headstall with light oil and single stitching. Equipped with dual sided diamond-shaped silver buckles with copper in-lain shamrock embossing. 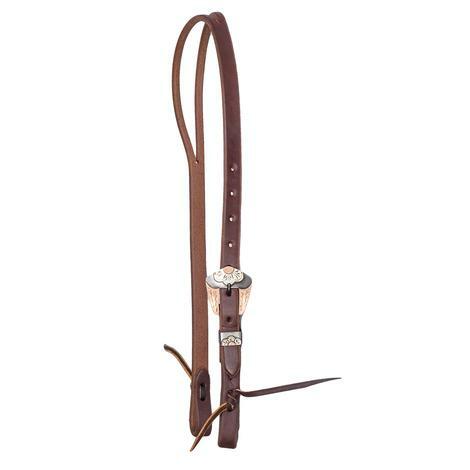 STT Slide Ear headstall in dark oil with double diamond silver buckles and star tooled centers. 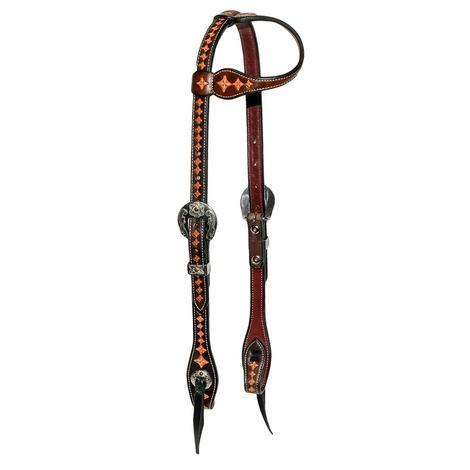 STT custom tack headstall offered by South Texas Tack in a typical slide-ear design has dual-side diamond buckles with copper inlaid shamrocks. Dark Oiled leather is tooled with light center-star throughout the length, and white single stitching throughout. Order today! 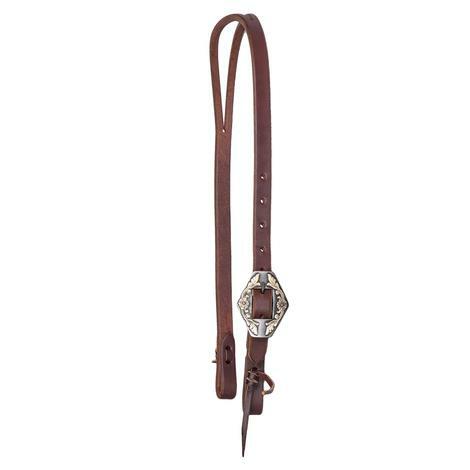 STT Premium Leather Oval Buckle Slip Ear Headstall 3/4"
This STT headstall boasts an oval buckle with a detailed four-petal flower design all around. 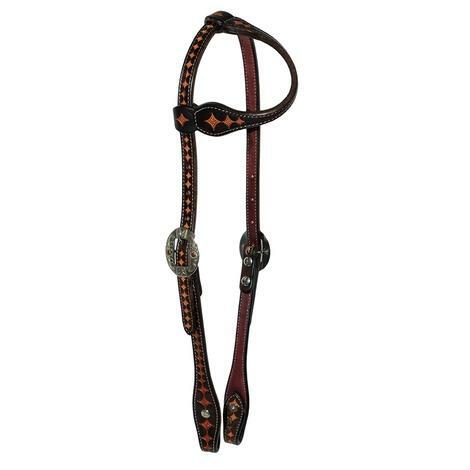 This oiled headstall features hand-rubbed edges that make it ready for work right off the rack. Another great addition to the tack room for the hard working cowboy and the everyday horseman. 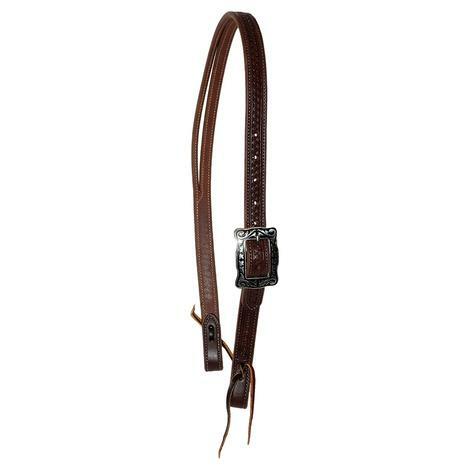 STT Premium Leather Hex Buckle Split Ear Headstall 3/4"
This STT headstall comes with a hexagon buckle that features a dainty floral design on either side. 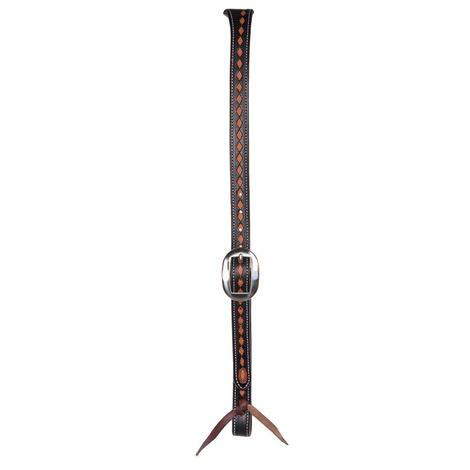 This unique design is a great addition to the tack room for the everyday horseman or the working cowboy. 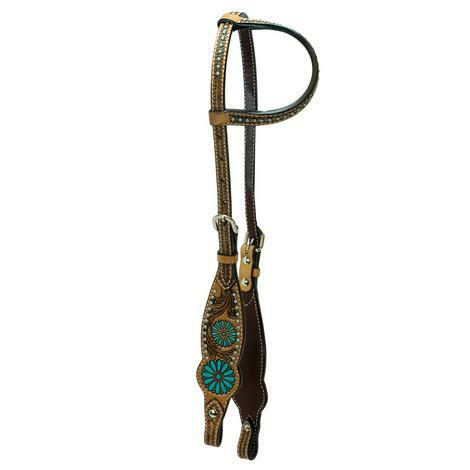 The oiled headstall features hand-rubbed edges that make it ready to go to work right off the rack. 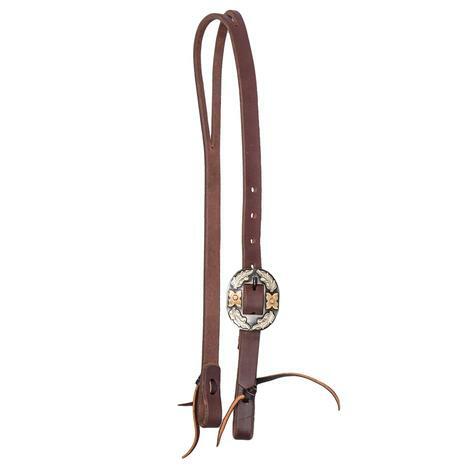 STT Premium Floral Buckle Split Ear Headstall 3/4"
This STT headstall, with its fine crafted floral buckle, will be a beautiful addition to the tack room for the working cowboy and every day horseman alike. 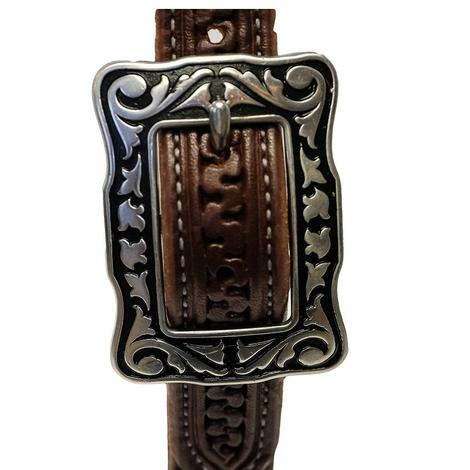 The buckle features a silver and copper half-flower design. 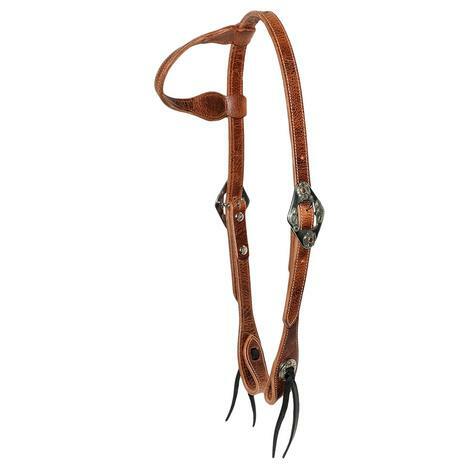 The oiled headstall features hand-rubbed edges that make it ready to go to work right off the rack.